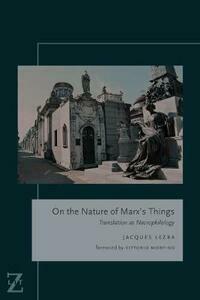 On the Nature of Marx's Things traces to Marx's earliest writings on the Epicurean tradition a subterranean, Lucretian practice that Lezra calls necrophilological translation. "Translation" here is extensively used, and covers practices that put different natural and national languages into relation, often across periods; but also practices or mechanisms internal to each language. Obscured by later critical attention to the contradictory lexicons-of fetishism and of chrematistics-that Capital uses to describe how value accrues to commodities, and by the dialectical approach that's framed Marx's work since Engels sought to marry it to the natural philosophy of his time, necrophilological translation has a troubling, definitive influence in Marx's thought and in his wake. It entails a radical revision of what counts as translation, and wholly new ways of imagining what an "object" is; "matter;" "value;" "sovereignty;" "mediation;" and "number." In On the Nature of Marx's Things a materialism "of the encounter," as recent criticism in the vein of the late Althusser calls it, encounters Marxological value-form theory; the development of so-called divisible sovereignty in post-Schmittian political philosophy; Meillassoux's critique of correlationism; the resurgence of humanism in object-oriented-ontologies; and philosophies of translation and untranslatability in debt to Quine, Cassin, and Derrida. Marx through Lucretius; through Spinoza's marranismo; through his translators. Freud's account of the agency of the unconscious, through Schiller's Don Karlos; Adorno's exilic antihumanism, against Said's cosmopolitan humanism; the absolutization of what is not-one, in Badiou, Meillassoux and Freud through Donne and Neruda: "Lezra," writes Vittorio Morfino in his preface, "transfers all of the power of the Althusserian encounter into his conception of translation: translation is never simple, and in every translation a multiplicity of mediations come into play, without which these mediations would be guaranteed by a telos."